Hardscape produced and supplied the Artscape ‘Literary Carpet’ hard landscaping outside the main entrance and inside the atrium area. This was a bold stone "carpet" designed to open up the space and to create a strong impact. 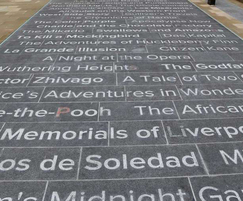 The names of over 100 literary classics were selected, after public constultation, to be included in the carpet. The letters were water-jet cut from contrasting coloured granites then inlayed into the slabs. The Central Library wall letters were cut from one piece of granite; the contrast was created by using by sandblasting the letters to contrast with the polished background surface. The forecourt was paved with Woodkirk sandstone and hand finished Crystal Black granite was used for the external benches. The Liverpool Central Library opened in May 2013 after a three year complete overhaul.